I was blessed to be a part of the delegation from the Diocese of the Mid-Atlantic at this year’s Provincial Council meeting. What a joy it is to see the church in its various jurisdictions, cultural breadth, liturgical expression and its longing to keep “the main thing, the main thing”: Jesus. I was struck by an overwhelming sense that this ship that we call the Anglican Church in North America is steering in the direction of "unity of purpose," while at the same time celebrating the unique gifts of individuals. We heard reports from the Task Force on Prayer Book and Common Worship, the commission working on a new Anglican Catechism, the new initiative from Youth With A Mission (YWAM) for an Anglican Discipleship Training School (DTS), and so many other encouraging reports that we are carrying out mission and ministry for the sake of the Gospel of Jesus Christ. I enjoyed speaking with the bishops from the Province and hear their stories of growth, challenge, and vision. I left Council greatly encouraged and look forward to moving ahead together as a church with boldness, grace, reconciliation, joy and peace. We are in a very different place than we were ten years ago. If we continue to hold up the Lordship of Christ and press in His call on our lives, we will be surprised at what God will do in ten more years! Photo: The Diocese of the Mid-Atlantic Provincial Council delegates: Dan Morgan, Ward LeHardy, Chloellen Miller, and Bishop John Guernsey. Thanks be to God and to each of you for the very great privilege of serving as one of our diocesan lay delegates to Provincial Council at Nashotah House, June 18-19. I still remember the overwhelming joy that welled up inside of me when our Diocese of the Mid-Atlantic was approved as a new Diocese at the Provincial Council two years ago. So many people worked so hard to make that happen for our Diocese, and the same can be said of each Diocese or Diocese-in-Formation that applies for membership in the ACNA. That same joy welled up again as one Diocese-in-Formation (DIF) and five new dioceses were approved by Provincial Council this year, and another learned that they will be approved when their documents are prepared and approved. I spoke with representatives of most of those groups and their joy was contagious! One group applied to become a "diocese in formation," even though their Average Sunday Attendance (ASA) and number of churches in were not large enough to begin the process of becoming a diocese. The recommendation for that group was “not yet.” When their representatives stood to address the Council, they asked to withdraw their application before a vote was taken. Why? They prefer to focus on their mission, reaching North America with the transforming love of Jesus Christ, whether they become an ACNA Diocese-in-Formation now or at some later date. Their humble and gracious response in spite of their disappointment will long be remembered, as will their transparency, their acceptance of the counsel of the governing body, and, in spite of differing opinions, their willingness to continue working together to share the love of Christ with those around them. Archbishop Duncan and others said so often during Provincial Council, we are called to keep the main thing the main thing, and our mission is “reaching North America with the transforming love of Jesus Christ.” Whether we experience victory, defeat, or disappointment, in every situation may we glorify Christ as we humbly share His love with those around us. 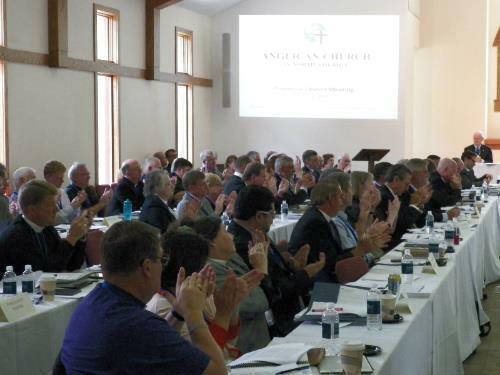 Photo: This year the Provincial Council met at Nashotah House, an Episcopal/Anglican seminary outside Milwaukee, Wisconsin. As I reviewed the maps showing the locations of ACNA churches, I realized the enormous challenge of diocesan “overlapping jurisdictions,” where churches from several dioceses might be in the same region. 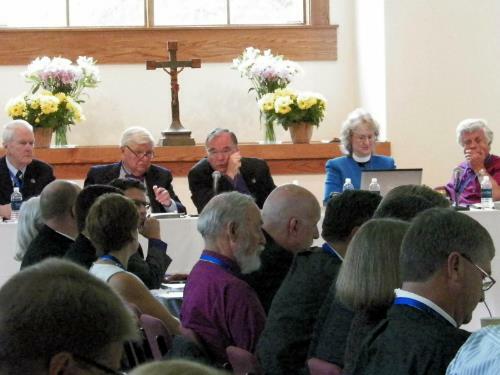 The Anglican Diocese in New England, with the support of all dioceses represented in that area, is exploring a model of cooperation within that region which could then be the model for other geographic areas of ACNA. Photo: The Anglican Church in North America Archbishop Robert Duncan leads the Provincial Council in their annual deliberations.